Christmas occurs during the season of Advent. Advent is four weeks long. It is a getting ready time for a very important event in the Christian calendar for the birth of the Christ child. 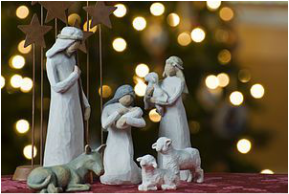 North Scottsdale United Methodist Church invites you to prepare for the birth of the Christ Child with our Sunday and Christmas Eve services, Sunday School classes, Christmas Cantata and Advent Celebration "Make & Take" event. Please join us! Our children-friendly Christmas Eve service begins at 4:00pm. It offers an informal children's play, Christmas carols and scripture. It features our three children's choirs; AngeliX, Kids of Grace and Cherub.